Vintage BBC Technics SP-10 Mk2 studio turntable unit turns up on eBay | What Hi-Fi? Bidding currently stands at over £2500. 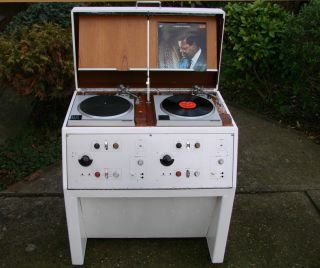 If you want to add some retro chic to your home system, look no further than this doozy found on eBay. It was used in the BBC's London studios in Broadcasting House to play vinyl and 78rpm material for transmission. It was also used to transfer records to tape for post-production projects. So it's a genuine slice of broadcasting history - and now it could be yours. As well as looking like something Austin Powers would use to play Barry White, the unit packs some seriously retro tech. It comprises two Technics SP-10 Mk2/RP2/9 turntables mounted on oak motorboards that are adjustable using independent spring suspensions, Technics SH-10 EP control power supply units that have been recapped and fully serviced, BBC-designed MP1-18 tone arms with headshells (complete with Ortofon OM moving-magnet pro cartridges and styli), stereo panel amplifiers, pre-amplifiers, and twin headphones jacks with pre-fade listening abilities and variable gain control. "Both Technics turntables operate smoothly and silently offering visual internal strobes and fast start times," the listing reads. However, while groove optical indicators are fitted, "they require setting up and alignment with the aid of a service manual". Other than that, it all seems to be working fine. Obviously such a historic piece commands a high price tag. At time of writing, the highest bid was £2550. But with over nine days to go, you can expect to pay a lot more than that.